As Anne Burrell often puts it: brown food tastes good. I fully agree, but it is a nightmare for food bloggers. Why? Taking a good picture is quite tricky. Granted, photography is not one of my fortes, but I am aware that even those who know their way around a camera need to work a little harder when faced with beef stews, chocolate brownies, and – case in point – meatloaf. This one maybe even trickier as the beef is mixed with cremini mushrooms. Double decker brown for you! Still, no matter the quality of the photos, I had to share this recipe because it is totally worth it. 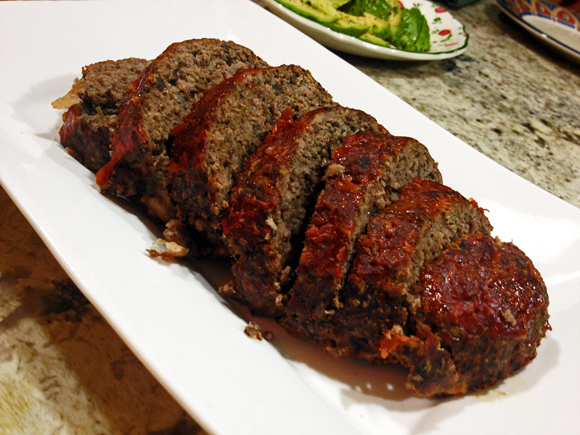 The mushrooms not only provide extra moisture to the meat loaf, but they add that enticing umami-ness. The recipe comes from Cooking Light magazine which is one of my favorite sources for weeknight recipes. Never too rich, always packing great flavor. Place the mushrooms in a food processor; process until minced. Do it in two batches if necessary. Heat a large skillet over medium-high heat. Add oil to pan; swirl to coat. Add minced shallot; sauté 3 minutes. Add garlic; sauté 1 minute. Add mushrooms; cook 7 minutes or until liquid evaporates and mushrooms begin to brown. Add sherry; cook 1 minute, stirring frequently. Remove from heat; stir in thyme. Cool slightly. Combine mushroom mixture, almond flour, and next 4 ingredients (through egg), mixing until well combined. Shape mixture into a free-form loaf on a foil-lined baking sheet coated with cooking spray. Bake at 375° for 20 minutes. Remove from oven; brush with half of ketchup. Bake an additional 10 to 15 minutes or until a thermometer registers 160°. Remove from oven; brush with remaining ketchup, if desired. Cut into 8 slices. One of the changes I made in the recipe from Cooking Light was using almond flour instead of Panko. If you prefer a more traditional take, go for breadcrumbs, same amount. 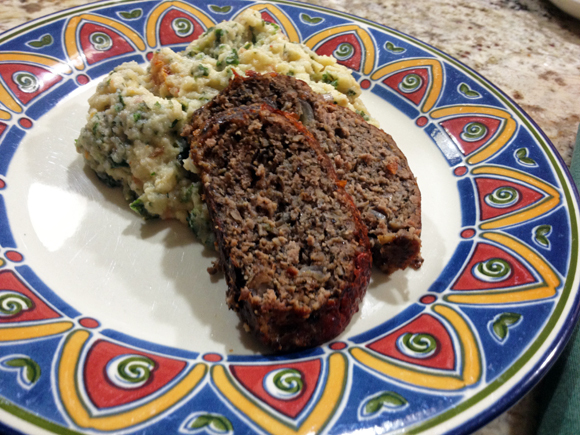 I served the meatloaf with mashed cauliflower and spinach, a recipe that I blogged about not too long ago. This was a simple, but delicious meal. You can prepare the mushroom mixture in advance, even a couple of days earlier to speed up dinner preparation. One of the best things of this meal: leftovers. My lunch next day was a couple of slices of meat loaf with a hard-boiled egg, and an avocado. The type of lunch that doesn’t make me sluggish during the afternoon. Love it! This looks great! I love Cooking Light’s recipes. Me too, I actually do not subscribe to the magazine, but buy it at the grocery store, every single issue. I should just go ahead and subscribe, don’t you think? Be done with it. I am soooooooo all over that!!!!! Hey, Sally, I love meatloaf and mushrooms!!! Sounds like something I would want to make. Do you think I could sub ground turkey or chicken? I eat beef, but, so many of my friends do not. Thanks for the recipe. You did a great job with the photography! Brown food really is tough…yet it is some of the tastiest stuff out there! I always smile when you comment on a post that involves meat, as I know you don’t cook or eat it…. 🙂 very sweet of you to stop by and say hello! now, to the photography, you should see the photos that did NOT pass the test to be shared in public. Oh, boy…. Gosh, did you know I never had a meatloaf sandwich? That seems quite amazing! note to self: try it next time! Ooh, Sally, this sounds amazing! I’ve tried quinoa in place of panko in meatloaf but not almond flour. It looks perfectly textured and I’m so curious about the flavor the mushroom imparts… a must try me thinks :D.
thanks Sally. I just bought the ingredients. Can’t wait! I’m with you, meatloaf is about the hardest thing to photograph. That said, yours looks amazing! Can’t believe I missed this one in CL, one of my favorite mags.